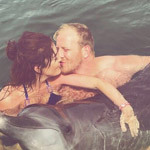 Interaction and Swimming with Dolphin in the Ocean. at least try once in a lifetime! 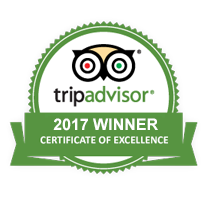 Most of our guests are very satisfied and recommend it to their family and friends, at least try once in a lifetime! Great Place! Centre of City. 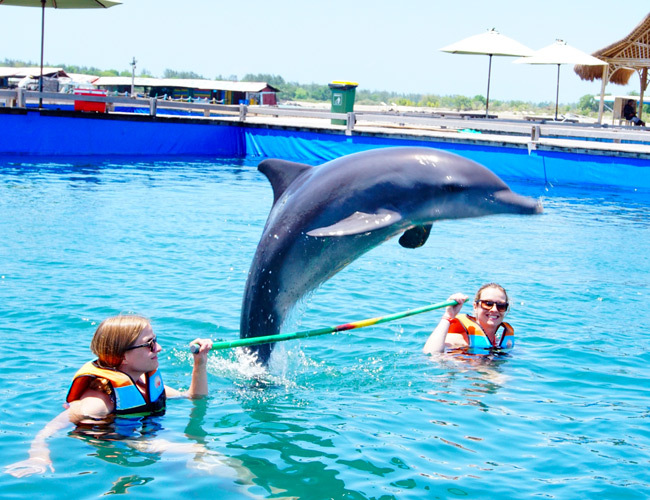 Experience the thrill and joy of interaction with friendly dolphins Bali. it's fun, educational and an unforgettable encounter of a lifetime! Our Dolphin lodge is designed by floating pool in the Ocean, it's means that all of the dolphins stay alive in the sea / their habitat (instead of chlorinated water). 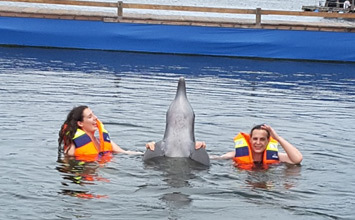 Be part of this unforgettable experience, for approximately 30 minutes you will have a beautiful moment by interaction with our friendly dolphin. 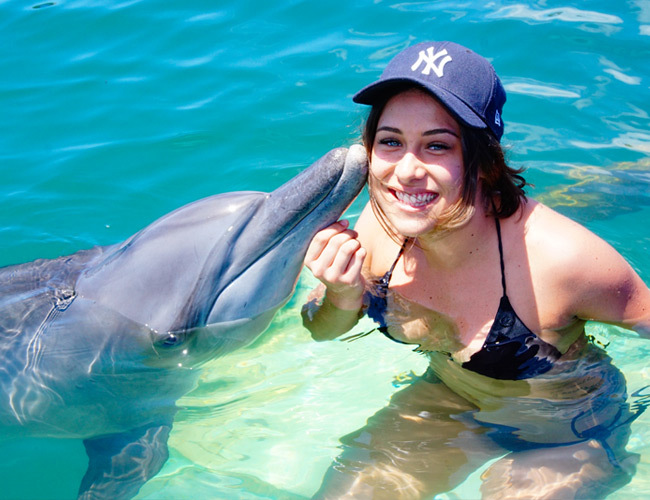 These friendly mamals will amaze you with their intelligence, physical ability and the softness, where you'll have the chance to experience the thrill of up-close and personal contact through hugging, petting, kissing and playing with a dolphin! 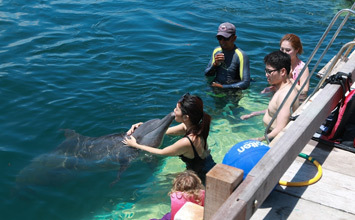 At each session the guests divided into 4 groups with each group a maximum of 6-7 persons, so you don't need to worry that you couldn't touch dolphin because of crowd. Bali Dolphin interaction, and Dolphin Watching. Interaction with Stingray FOC FOC - Subjected to weather conditions and advice from our trainers. Due to very high demand and limited number of dolphins, please make reservations at least 1 week in advance to avoid disappointment due to the condition of being fully booked. 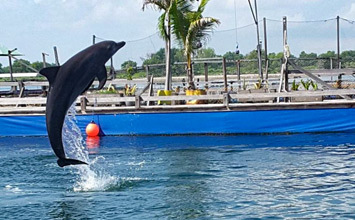 Total duration for this Bali dolphins tour from the pick up untill arrive back at the hotel is about 3 - 4 hours depend on your hotel location. 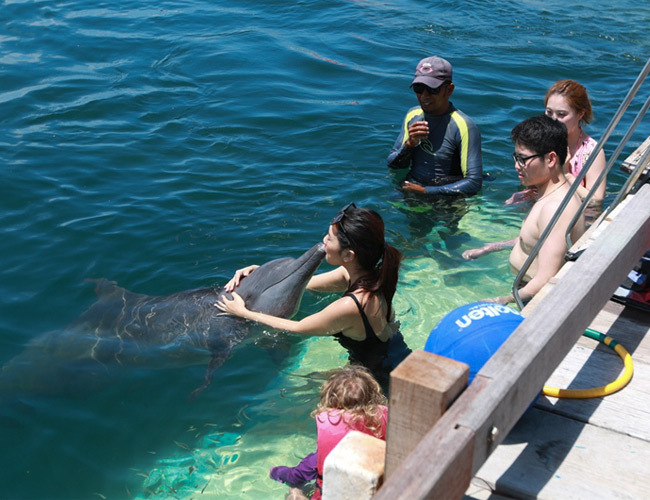 You will have about 30 minutes duration to Interact with the dolphin in the pool, enjoy the private interaction with our friendly dolphin, such as: kissing, hugging, playing in many trick and even carry him in your hand. We have 4 sessions per day, First session trips start at 9.00 AM and the last session start on 2.00 PM. 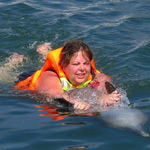 Booking Online is The easiest way to make booking for our Dolphin tour. Or you can contact us by Phone and Whatsapp for last minute booking. Confirmation, we send you a confirmation by email when the space available and everything clear. Book now and pay later in the Dolphin Lodge Bali location, or just 25% deposit for group booking more than 5 persons. We accept Payment via Cash, Credit Card, Bank transfer, Online payment and Paypal. (verified paypal account). Booked a swim with the dolphins today. It was absolutely the best. Love the fact that a floating island was purpose built for them and they can jump out and leave any time. 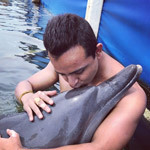 Triton the dolphin I swam with has chosen to work with our trainer Julio for 12 years. Gentle and playful and the staff were great. There were also mantra rays that you could swim with. Next time I will make sure the kids come. Best part of the trip for me! Dear Ms. Ani, I am writing to tell you what a fabulous day my mother and I had at our Dolphin experience last Friday! I had done the experience before (at your old facility) and knew my mum would love it. It was exactly what we wanted. I’d also like you to pass on our thanks to our driver Arman. He had great conversation, drove well and I enjoyed the music he was playing also. Thank you again for running such a great experience.